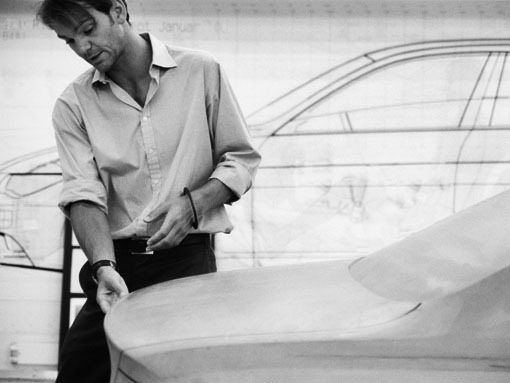 With the recent resignation of BMW’s Head of Design, Chris Bangle, it was only natural that Adrian Van Hooydonk will move up to the top position after being Director of Design since 2004. But who is Adrian Van Hooydonk and can he replace the charismatic Chris Bangle? After earning a degree in Automotive Design at Art Center Europe, Switzerland, in 1992 he joined BMW as an exterior designer. His talent was shortly noticed by Bangle and after DesignWorks opened an office in Munich, in 1998, Adrian started to work as a designer there. In an internal competition, he won the design proposal for the E65 7 Series. At the time, he was 33 years old and was one of the 20 designers competing in the internal competition. Bangle backed his early sketches and guided him throughout the process. But his final full-size model was the one that won over the entire BMW board, starting a close relationship that eventually put him at the top. Van Hooydonk’s first concept at DesignWorks was an early version model for the Mini and shortly after, he was appointed to design the Z9 Concept, a model that showcased the upcoming BMW design language. With more and more experience under his belt, he also won the E63/E64 6 Series design competition. As an appreciation for his talent and vision, in 2000 he was named Head of Automotive DesignWorksUSA, Newbury Park, CA. A year later, he takes over the President position. In 2004, at just 40 years old, he was given responsibility for the design of the whole BMW range under group Design Chief Chris Bangle. Now, with all the credentials and achievements out of the way, let’s find out more about Adrian’s personality, ideas and concepts. To those that know him very well, Adrian is a much more mysterious person that Chris Bangle was. Having met Adrian at the Detroit Auto Show, I can certainly attest to that, but in the same time, he is very approachable and open to discussions. His ideas on all the design languages was and is in sync with Bangle’s views, both love modern designs, but Adrian prefers more sophisticated and restrained styling. Adrian likes traditional forms with experimental and strong details, while Chris was more interested in form experiments as well. Adrian’s sense of aesthetics is much more traditional: more cohesive and with sophisticated lines and shapes. In the end, they both shared a common vision for BMW: modern and avant-garder approach. Adrian’s influence in the latest designs has been obvious, sharp, moder and practical designs, without clumsily executed details. As far as the future models, flame surfacing will stay for quite some time and there will be more exciting design details introduced: new interpretation of BMW grille, Hofmeister kink and quad headlights. Adrian’s relationship with the BMW Board is being said to be very close, constructive and based on common trust. Us, at BMWBLOG wish him all the best and good luck in this new adventure.